Foster Poultry Farms of Farmerville, La., is recalling approximately 131,880 pounds of frozen, ready-to-eat breaded chicken patties that may contain pieces of plastic. The clear, soft pieces of plastic originated from the firm’s packaging materials. 5-lb. bags containing 20 pieces of “FOSTER FARMS Chicken Patties BREADED CHICKEN BREAST PATTIES WITH RIB MEAT” with Best By date of 02/15/18. 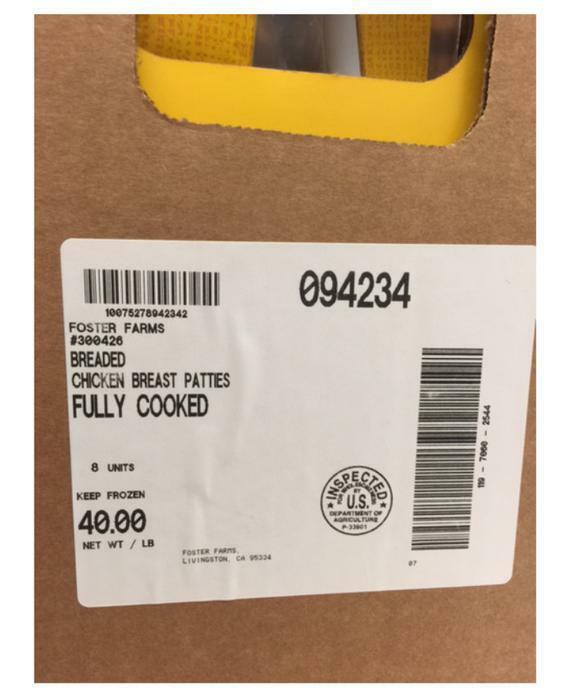 The recalled products, bearing establishment number “P-33901” inside the USDA mark of inspection, were shipped to distribution centers in Alaska, Arizona, California, Utah and Washington. Customers who purchased the recalled products should not consume them, but throw them away or return then to the place of purchase. Consumers with questions about the recall may contact the firm's consumer affairs department at 800-338-8051.